Some of you looked at the title of this blog and said “Wonders of Life? Never heard of it”. Others saw the title and said “Boy do I ever miss that building”. It all depends how long you’ve been going to Walt Disney World and/or your knowledge of the history of Epcot. Now if I mention “Festival Center at Epcot” I bet a lot more readers will know what building I am referring to. For many years that building was the place to go for merchandise and events during the Epcot International Flower & Garden Festival in the Spring, and during the Epcot International Food & Wine Festival in the Fall. Well, that exact same building used to house a number of attractions and interesting/fun things to do, and back then it was known as the Wonders of Life Building. Located between Mission Space and the former Ellen’s Energy Adventure (soon to be a Guardians of the Galaxy Coaster), the Wonders of Life first opened in October of 1989. Epcot was 7 years old at that time. Back then Epcot was a lot more about education than it is these days. The building showcased science, health, and fitness in a fun and imaginative way. It was a place to learn without even realizing you were being taught something. The front of the building sported a HUGE model of a DNA molecule (which remained for a number of years after the Wonders of Life closed). 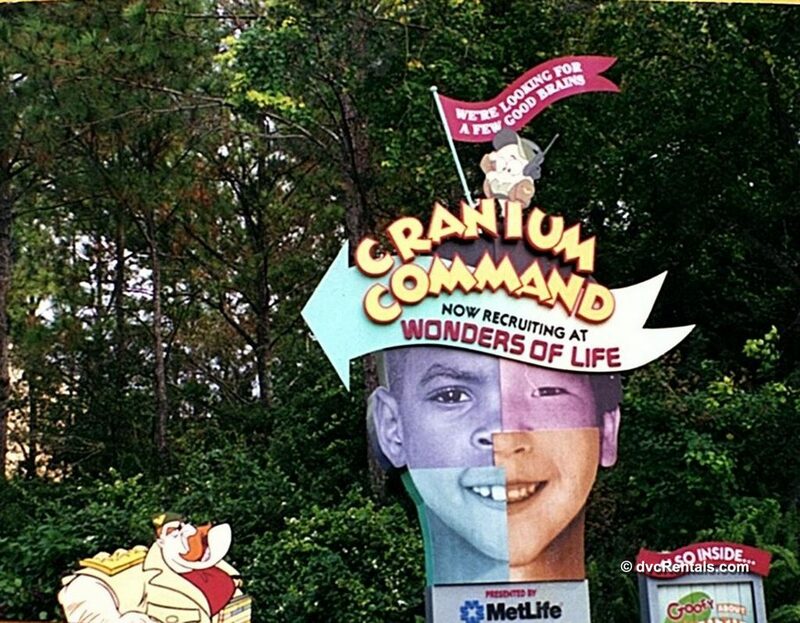 Wonders of Life was sponsored by the insurance company Met Life. On opening day, MetLife CEO John Creedon spoke about how the pavilion would “continue the MetLife tradition of educating the public about good health and healthy lifestyle”. Not only were the 3 major attractions in the building meant to increase your knowledge of health, there were a number of smaller exhibits that did that as well. For example, you could pedal a bike, known as a “Wondercycle” while looking at a screen and it appeared you were pedaling around an actual course. There was a choice of courses, my favorite being the one that had you riding around Disneyland! 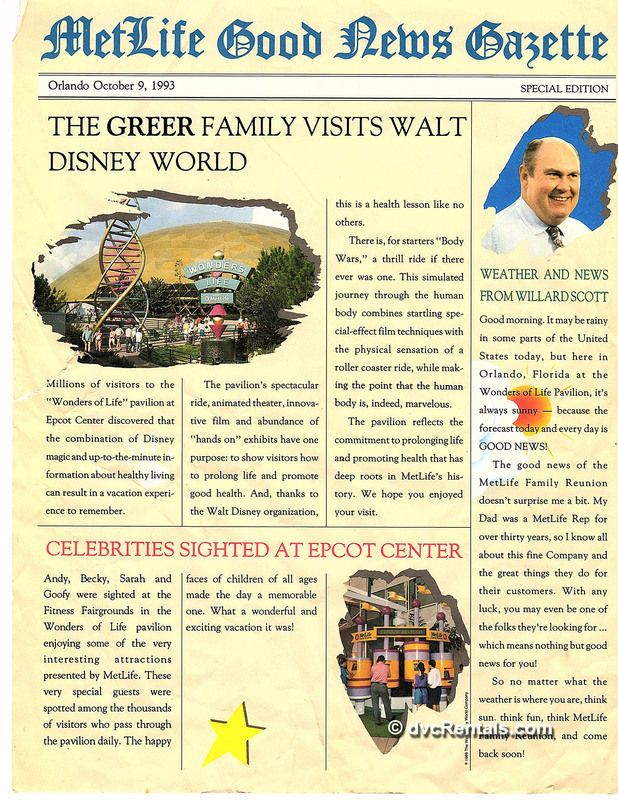 As a bonus, Met Life had a kiosk in which you could fill in the information of your family, and you would receive, at no cost, what looked like the front page of a newspaper, with your family’s name headlining the paper, I.e., “The Smith Family Visits Walt Disney World”. There were also articles that included the first names of the people in your family. Close by to Wondercycles was an area known as the Sensory Fun House. Here you could find a number of games to thrill all five of your senses—Touch, Taste, Sound, Vision, and Smell. Adults and children alike had fun trying out all there was to do here. The names of these small attractions included Crooked Room, Touchy Subjects, Reading Braille, Perlexion Pipes and Optical Illusions. Touchy Subjects had you put your hand into a box and try to figure out what was in there merely by touch. A favorite of my kids when they were small were the Perlexion Pipes. If you stood on one end of the pipe and spoke into it, you could be heard on the other end of the pipe, which was a considerable distance away. The pipe itself curled around and up and down, it was not just a straight pipe, which made it all the more impressive when you heard your family member as clear as a bell on the opposite end of the pipe. There were two major attractions at The Wonders of Life, one smaller one and there was a comedy troupe called the AnaComical Theater. The comedy show was very amusing, while at the same time teaching us about health. The smaller attraction I referred to was known as “The Making of Me”. This was a short movie, starring Martin Short (before he moved on to O Canada in World Showcase). Marty showed us how a baby is made in a very G rated way, that was also very funny and educational. One of the major attractions, and it was quite a hit in its time, was called Body Wars. Body Wars was a motion simulator, very similar to Star Tours at Disney’s Hollywood Studios, but at the time it was relatively new technology, hence the popularity of the ride. Only instead of flying through space a la Star Wars, you were “shrunk down” to the size of a cell, traveling through the human body. The story line was fun, the main purpose to find and remove a splinter from the body. You learned about different types of blood cells as well as human organ systems, while you travel through your adventure. The other major attraction, and a personal favorite of this author, was Cranium Command. I really cannot express properly in words how cool this was. First, you would enter a room and watch an animated show, which starred General Knowledge, a military-looking fellow who knew all about the Brain. It was his job to assign “pilots” to run the brains of various people. In the movie, you would see people’s heads flipped opened (remember it was a cartoon, so it was not gross to see), and the General would assign a pilot to each brain before closing up the head again. One of the more confused “recruits”, Buzzy, had the most difficult assignment of all—Piloting the brain of a 12 year old boy. As the movie ends General Knowledge directs you into a theater where you see Buzzy, only instead of being a cartoon he is now an audio animatronic character. It’s his job to get the adolescent boy off to school on time and to deal with a number of pre-teen issues, such as bullies and young love. In addition to Buzzy, who was all the way on the right side of the room, there is a huge screen shaped like a human body front and center. As Buzzy pilots the brain, he interacts with various parts of the body. One of the most enjoyable aspects of this is that the various body parts are inhabited by comedians, all well-known at the time, most still famous to this day. Jon Lovitz was SO funny as the emotional right brain, while Charles Grodin was excellent as the logical left brain. The hungry stomach was played by George Wendt (Norm on the TV show “Cheers”, Bobcat Goldthwait was literally hysterical as the adrenal gland, and Hans and Frans from SNL (Dana Carvey and Kevin Nealon played ventricles in the heart (“we love to pump you up!”). The various parts of the body argue about how to handle stressful situations, and at first, Buzzy has a very difficult time piloting the brain. In the end, Buzzy (with some assistance from General Knowledge) learned how to effectively balance the needs of his body crew in order to deal successfully with potentially stressful situations. Sadly, it was not due to lack of popularity that the Wonders of Life closed down. Met Life decided they no longer wanted to sponsor the building in 2001. The building was not kept up very well after that, and in 2004 was open only during very busy park times, until it closed completely in January of 2007. That same year the building became the Festival Center during the Food and Wine Festival in the Fall. 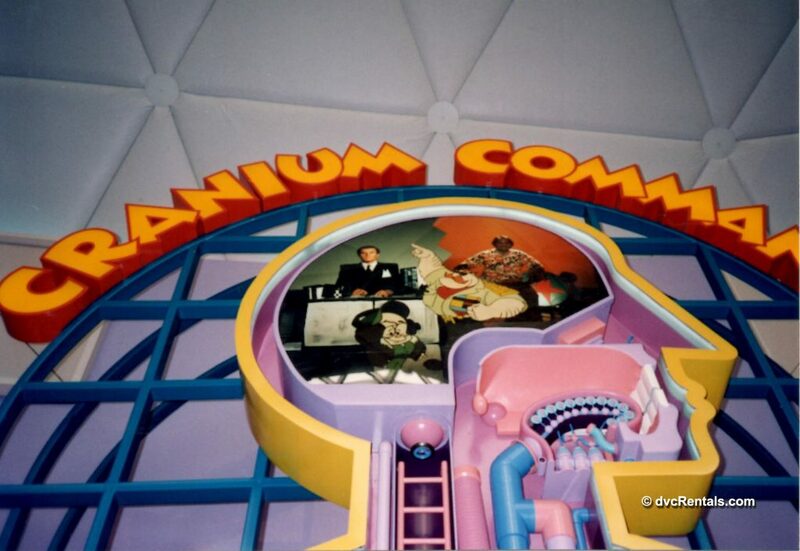 Cranium Command and Body Wars were hidden behind walls or curtains. The theater where you watched The Making of Me was repurposed as was the stage for the AnaComical Players. 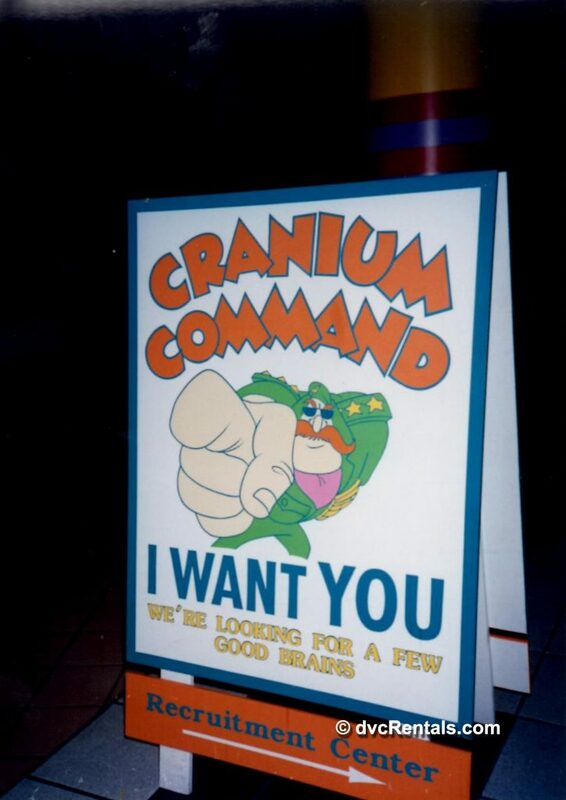 For a while, fans held out hope that perhaps Body Wars or Cranium Command would one day re-open. Those hopes were dashed when the attractions were basically completed gutted. Until this year, the building not only housed the Food and Wine Festival, it also was the Festival Center for the Epcot International Flower & Garden Festival (as mentioned earlier). Many guests were chagrined that a place that had two very popular attractions was replaced with a center that was only open certain times of the year, and even then, sometimes only on the weekend. However much to the surprise and delight of guests, the building is now being refurbished and as of 2018 will no longer be a Festival Center. Rumors abound as to what it will be used for, but the hope is that an awesome attraction (or attractions!) are planned for this former shining glory.